The Pourty potty won Best New Product to Market 2010/11 and is consistently rated 5/5 in potty reviews for quality, value for money and ease of use.The Pourty Potty offers the convenience of a basic potty, is as easy to empty as a two piece potty and its unique one piece design makes it more hygienic to empty and easier to clean. a sturdy plastic that gives children confidence that it will hold their weight and reduces the risk that the potty will stick to their bottom when they stand up. When emptying a conventional potty you have to pour the pee and/or poo over the area where the child sits and pee dribbles down the side of the potty and can go everyewhere. The two sides of the back rest of the Pourty potty offer ample support to your child if they do lean back and are shaped for maximum comfort. 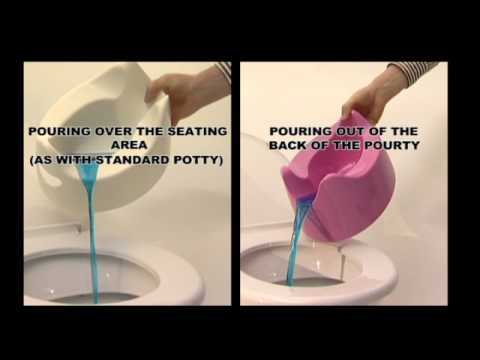 "Check out our video, which shows how well it works and how badly a normal potty pours. Watch out for the prunes!"